With only five belts in jiu-jitsu, anytime anybody gets gets promoted it is a pretty big deal. When it’s a high-level competitor, even more so. For a competitor, a promotion means being put in with even tougher opponents. Take a look at some of the biggest names who were rewarded for their success in 2017 with a belt promotion. Gracie Barra’s Servio Tulio was awarded his black belt after conquering the brown belt medium-heavyweight division at No-Gi Worlds. Tulio is a fierce competitor with a sizable collection of medals from his time as a brown belt. In addition to his World No-Gi gold, he took silver at Pans as well as winning a brown belt tournament at the Marianas Open in Guam and multiple championships in the hyper-competitive tournament scene in Russia. A born-and-bred New Yorker, Adam Benayoun was a Pan and European featherweight champ at brown belt. He moved to Virginia in March of this year to train under Ryan Hall, who tied the black belt around his waist just last week. Sao Paulo-based grappler Fellipe Trovo of Ushirobira BJJ team is a well-known face on the Brazilian scene. With a number of high-profile wins (he is a Brazilian National champion, no less) the super-heavyweight will bring his long legs and tricky guard game to the black belt ranks. Another Brazilian champion promoted to black belt is heavyweight Fellipe Andrew of Zenith. Training under Rodrigo Cavaca in Santos, Sao Paulo. Fellipe Andrew Leandro Silva (to use his full name) win 2017 Pans as a brown belt and 2016 Worlds as a purple. 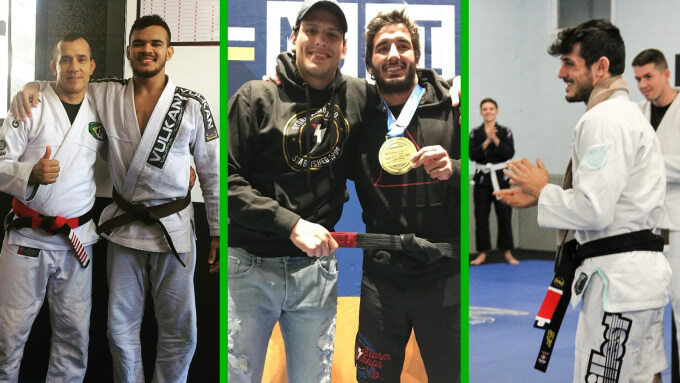 One of the most accomplished purple belts of 2017, Mauricio Oliveira of GF Team was promoted to brown belt after an incredibly successful year. The IBJJF World and Abu Dhabi World Pro champion, Oliveira spent a season in the USA after his big win at Worlds where he trained in Ohio. While in the US, Oliveira continued his winning streak and took gold in many tournaments including the American Nationals, NY BJJ Pro and IBJJF Opens in Miami, Charlotte and Chicago.